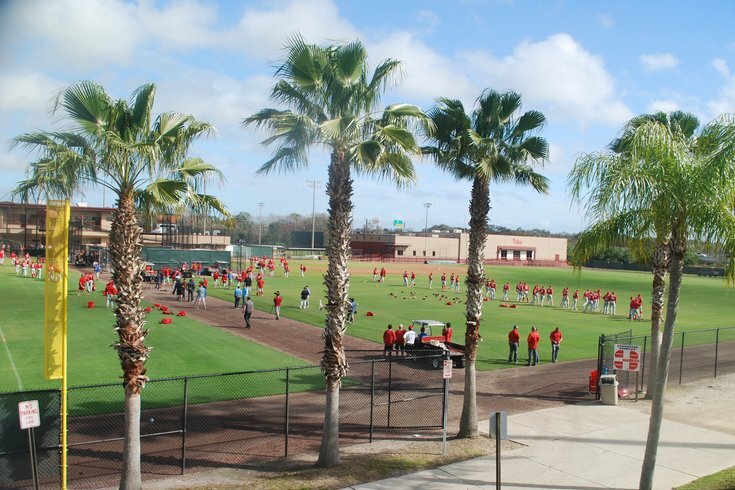 Phillies pitchers and catchers report to Clearwater, Fla., three weeks from today. The team holds its first official workout a day later, on Feb. 14. Everyone loves a Monday morning in the winter, right? Take a look outside and you’re immediately eager to meet the day with vim and vigor. Wait, what’s that? Oh, right. The opposite. Here’s a warm thought as you stare blankly at your office computer monitor wondering if the sun will ever return to Philadelphia: close your eyes and imagine the sweet sound of mitts popping as the palm trees easily sway to and fro above the crystal blue Clearwater sky. Phillies pitchers and catchers report to their spring training home in Florida three weeks from today. The first workout follows on Feb. 14. Sure, it can become monotonous after a few days, but there’s also something very therapeutic about watching two grown men play catch under a warm sun in February. Well, at least for all of us ready to bid farewell to winter. Here’s a fun number: 40 percent of the Phillies 40-man roster is made up of players that play the same position: starting pitcher. There is obviously no way that all 16 of those pitchers remain starters two months from now, let alone for the entirety of the 2017 season. The fact that a trio of those 16 is coming off season-ending injuries (Aaron Nola, Zach Eflin, Mark Appel) makes it a bit easier since they could arguably be eased into their ’17 workloads. And the depth behind them (and depth in general, since pitchers get hurt every year) is vital. But among the sweet sixteen in Clearwater, with only five jobs open in Philadelphia and just five more at Triple-A Lehigh Valley, you’d have to imagine at least one or two names auditioning for different roles in another month. There are only so many innings to go around at the Carpenter Complex. You could make the case for a guy like Alec Asher moving to a reliever role, but he came on pretty strong following a lengthy suspension last summer and continued to pitch well in winter ball, too. It’s too early to think of a role change for many other prospects, like Ben Lively or Ricardo Pinto or Nick Pivetta. The most obvious candidate for a new role: Adam Morgan. Morgan, who turns 27 next month, won’t be a favorite to win a job in the big league rotation, where he’s made 36 so-so starts in the last two seasons. There are pitchers with more promise on the minor league depth chart, too. As a left-hander with big league experience, Morgan would seem to make a lot of sense as a long man/swing man out of the bullpen, where the Phillies have barely any left-handed options (rookie Joely Rodriguez and non-roster veteran Sean Burnett). Honestly, this isn’t that big of a deal, but it’s mid-January and the Phillies have nearly everything else taken care of (it’s crazy you can already pen an Opening Day lineup, right?) heading into camp. The front office has added veteran depth nearly everywhere, to the offense (with Howie Kendrick and Michael Saunders), to the rotation (signing Clay Buchholz, retaining Jeremy Hellickson), and to the bullpen, too (adding Joaquin Benoit and Pat Neshek). Cesar Hernandez remains unsigned, though, and it’s something they must take care of within the next month in order to avoid an arbitration hearing. Is there a problem going to an arbitration hearing? Not really. They can be contentious, but they can also be helpful and productive in getting two parties to see just what the other sees in a player’s value (which, with the right player, can be helpful in the form of constructive criticism). It’s difficult to see the Phils and Hernandez going to a hearing, though. Hernandez was one of 24 major leaguers that couldn't agree to a new contract with his team two Fridays ago, the deadline for players and teams to exchange filing numbers. Only two of those 24 players have come to agreements with their teams since, but it really hasn’t been that long (one work week). In his first year of salary arbitration, Hernandez filed for $2.8 million while the Phillies filed $2 million. Sure, they should meet in the middle and be done with it, and it that takes the Phillies who have plenty of excess cash even after signing Saunders) to bump that number to $2.45, so be it. Hernandez has some obvious faults. As we pointed out in September, he was just one of eight Phillies players since 1901 to have fewer than 20 stolen bases while having been caught more than a dozen times and, ironically, the first since current first base coach and baserunning instructor Mickey Morandini 20 years ago. But Hernandez, while prone to the occasional mental hiccup, was better on the base paths a year earlier (19-of-24 in stolen base attempts) and the rest of his offensive game was exceptions for a first-year starter, hitting .294 with a .371 OBP, a surprising six home runs (four more than he’d hit in 227 MLB games entering 2016) and 11 triples (tied for the MLB lead). As the likely leadoff hitter, Hernandez should be a pivotal piece for the Phillies offense again in 2017. So just meet in the middle and get a deal done before camp, avoiding any possible distractions for the still young-and-improving infielder. Speaking of contract issues that should be avoided for the betterment of the team heading into camp, don’t be shocked if ownership and the front office repeats what they did in Clearwater late last March: extends the contract of manager Pete Mackanin. As it stands with three weeks until camp opens, Mackanin is only guaranteed to be under contract for the 2017 season. The front office holds a club option for 2018. It’s a similar setup as the one Mackanin entered heading into the 2016 season, with Matt Klentak and the Phillies front office not only re-working his 2016 contract but also tearing up the ’17 club option and giving the likable manager certainty for the following season, too. “I hope they pick it up but that's not up to me,” Mackanin said at the Winter Meetings last month. “That's up to them. I feel that when it's time for them to let me know, they'll let me know. Is Mackanin worthy of an extension? The Phillies were 25-28 in July and August of last year before coming undone in September (10-17) when pitching injuries caught up with the roster. With an improved roster, Mackanin should be expected to improve upon the team’s 71-91 record from a year ago in 2017. So, surely the front office could wait and see how Mackanin guides his team through the first month or two into the season. But the Phillies ownership has the ability to take care of it sooner rather than later, too, and avoid Mackanin entering lame-duck status on Opening Day. The worst thing that could happen is they’d change their mind come September. But in the big business of baseball (in a big market like Philadelphia), it’s not a financial commitment that would sink the team by any stretch.